Explanation: One year ago, Comet 17P/Holmes amazed sky watchers across planet Earth. A stunningly rapid outburst transformed it from a faint comet quietly orbiting the Sun with a period of about 7 years to a naked-eye comet rivaling the brighter stars in the constellation Perseus. Its largely tail-less shape, as in this wide-angle view recorded on November 11, 2007, became well-known to astronomers trying to unravel the mystery of the comet's surprising outburst . 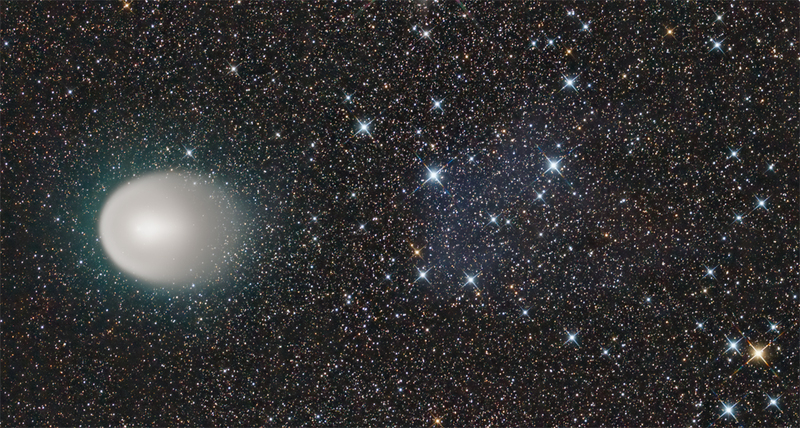 Still, Comet Holmes had a dim ion tail that was seen to separate from the bright coma. In this image, the separated tail creates the illusion of a reflection nebula. It appears as a faint bluish haze right of center against a background of stars in the loosely grouped Alpha Persei Moving Cluster.